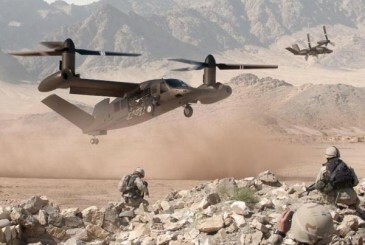 Bell Helicopter revealed today the Bell V-280 Valor, its offering for the Joint Multi Role/Future Vertical Lift (FVL) Technology Demonstrator (JMR/TD), at the 2013 Army Aviation Association of America’s (AAAA) Annual Professional Forum and Exposition in Fort Worth. The Bell V-280 Valor, Bell Helicopter’s third generation tiltrotor, offers the U.S. Army the highest levels of maturity and technical readiness. With its U.S. Army-centric design, the Bell V-280 has the capacity to perform a multitude of missions with unparalleled speed and agility. The Bell V-280’s clean sheet design reduces complexity compared to previous generation tiltrotors, with fewer parts, as well as non-rotating, fixed engines. The Valor delivers the best value in procurement, operations and support, and force structure, providing increased maintainability, component reliability and systems designed to reduce operational and support costs. Bell Helicopter is the world’s premier tiltrotor expert ranging from first generation XV-3 and XV-15, to the second generation 609 civil tiltrotor and the combat-proven V-22 Osprey. Backed by unmatched experience, Bell Helicopter is building a team of premier aerospace leaders, the best engineering resources and industrial capabilities in the industry to meet the U.S. Army’s needs. This entry was posted in Military, The Americas and tagged Bell Helicopter, Bell V-280 Valor, Mitch Snyder, Textron, Tiltrotor, United States Army, US Army, VTOL by thedefencejournal. Bookmark the permalink.